Frank Douma is a Research Fellow and the Associate Director of the Humphrey School of Public Policy at the University of Minnesota, as well as a Research Scholar at the school’s Center for Transportation Studies. He’s particularly interested in studying the public policy and legal concerns that driverless cars present. 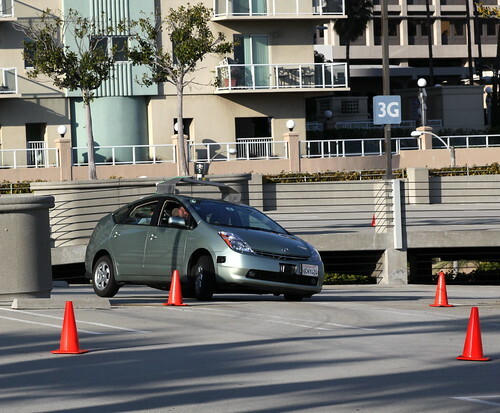 In January, Douma, who also holds a Juris Doctorate, spoke at the Santa Clara Law School Symposium about how self-driving cars will necessitate new laws and public policies. He talked with GJEL about these issues and more in this exclusive interview. GJEL: What are some of the specific questions that driverless cars will pose to the legal community? Douma: The real thumbnail is this: If to any extent you still allow the person in the driver seat to have the capability to override the car, you then still leave the bottom line of liability with the person driving. However you are talking about situations where the car is taking over vastly increasing amounts of minute-to-minute and second-to-second responsibility of operating the vehicle, so the degree of responsibility does shift toward civil liability rather than criminal liability. The extent that you are dealing more with negligence, wrongful death, and wrongful injury vs. criminal homicide or even speeding depends on how much responsibility the person has to operate the car and to what extent he is able to take control of the car and operate it. GJEL: Are there any laws that take a shot at responding to this conflict? Douma: Nevada has a law on the books and they are about to propose implementing regulations. Hawaii and I think Florida are now looking into similar regulations to make it legal to at least put one of these cars on the streets. The Nevada regulations are interesting in that on the one hand they require the car to be able to monitor itself so well that it knows when something is not operating properly and if it discovers that problem, it must take itself out of the traffic flow and shut down. On the other hand, it still requires that the vehicle have an override capability so that a human can take it over and operate it and that the person who is in the driver’s seat actually have some kind of operator’s license– whether that’s an autonomous vehicle operator license or just a regular driver’s license is not clear, at least to me. The question that this raises on the practical side is because this is a vehicle that can safely and legally operate itself, people who are in the driver’s seat are exempt from the ban on texting while driving. To me this creates a bit of dichotomy where you say we are going to allow the driver to engage in other activities besides driving, which makes some sense, but you are still making the driver responsible to be actually able to drive this car. GJEL: It seems that it would be almost impossible to make a hard rule about when the person driving is fully responsible, from a legal sense, for what happens on the road. Here’s another issue: If you have a self-driving vehicle that no one has to be in, is that a tool of terror? Theoretically you could put a bomb in the back or in the seat and send it on its merry way to create all sorts of havoc and mayhem without even having somebody put their life at risk along the way. GJEL: You said Nevada has some laws on the books already, what model do their laws offer for legalizing this technology? That’s something we wrestled with at the symposium. What would be the way that suddenly this technology would get deployed? You aren’t going to have complete changeover over night. So going from the existing system to autonomous cars on an autonomous highway system–we aren’t going to see that in our lifetime, maybe not in our children’s lifetime. But how we see this progressing forward is that there will probably be some sort of trickle into the system. Douma: Our thought was that roadway congestion would inspire some enterprising person with deep pockets and who sees some opportunity with the technology would create a private freeway for people with autonomous vehicles only. So people could drive their autonomous vehicle normally between Boston and New York or San Francisco and LA, something like that, and they could get on to the special freeway and let it operate by itself. It would be a tolled system to cover the cost of maintenance of the roadway and people could afford to be on it because early adopting folks would have to be wealthy to afford to buy these autonomous car. And if it become popular enough that would create demand to integrate them into the mainstream. I think it has to be some kind of incremental approach. Consider what would make people want to buy into this. It seems hard to figure out why someone would buy a self-driving car to sit in the same congestion with everyone else. There probably would be some safety improvement; because of the 32,000 traffic fatalities last year 95% were at least somewhat attributable to human error. And that’s the other prong of how this progresses: instead of introducing a self-driving vehicle all at once, you introduce the safety pieces into cars and so overtime people get more and more used to cars handling those types of duties. That benefit in itself, though, is that going to cause people to buy it? Or would you want to sell the technology with additional advantage like driving faster and safer and introducing tangible, realizable everyday benefits? Douma: There is an issue right now that a significant chunk if not the majority of driving public does not respect the responsibility they have when operating a car. A lot of the time they think it has become almost mindless so they would rather make sure the music is just right or get in touch with friends by phone (text or talk) or do anything to make sure that driving time is being used a profitably as possible. And that is at the expense of them being really ready to handle an emergency situation should one occur. And you could even extend that analogy that people have become so dependent on their vehicles that they think they should be able to drive them home after they’ve had a few drinks. Automated vehicle travel can address a lot of those questions by recognizing that people really, in the end, don’t appreciate what they should be doing in the car, so maybe they shouldn’t be the ones who are actually handling them. That’s part of the utopia; you could nip the distracted driving question in the bud. You might be able to reduce the number of drunk driving accidents. But until you get to that point, there is a significant role for public policy to try and remind people about their responsibilities and try to enforce that they should pay attention to them. GJEL thanks Mr. Douma for his time and insight!